Zen Studios sure plays a mean pinball, from Nintendo DS' obscure Flipper Critters through to its Marvel-licenced efforts more recently. 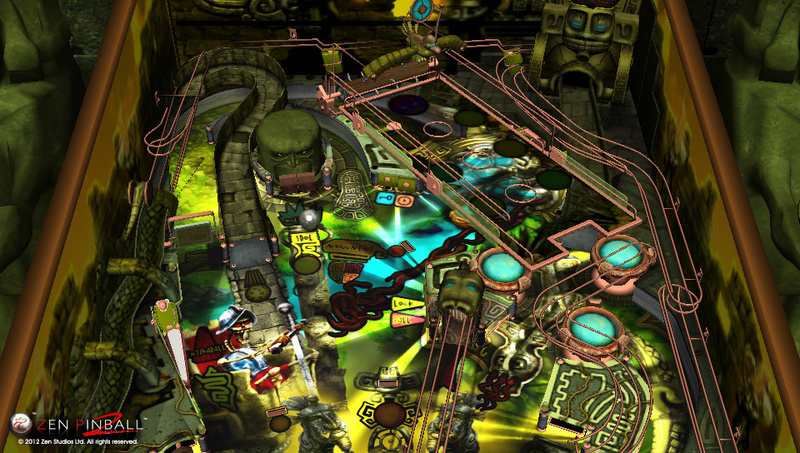 With the release of Zen Pinball 2, the developer hopes to unify its past work under one banner for the future. 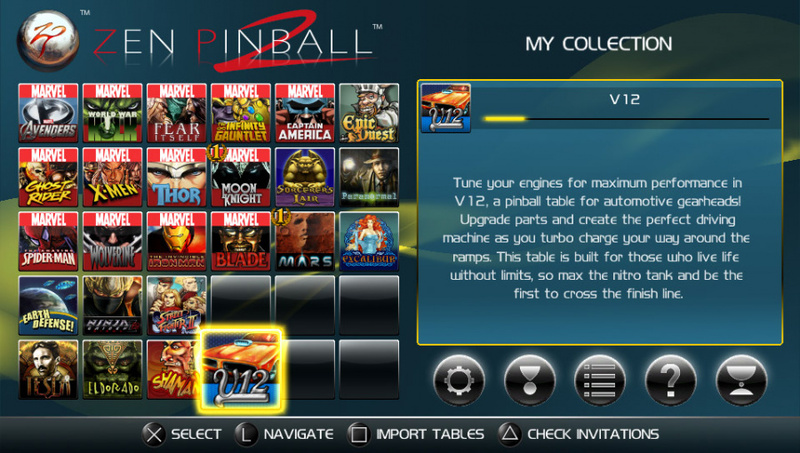 It's a term that's been flipped around a bit for a while, but Zen Pinball 2 is designed as a platform to contain all the pinball you'd ever want or need. It's a free download, but all that gets you is a rather nice user interface with a lot of blank spaces. 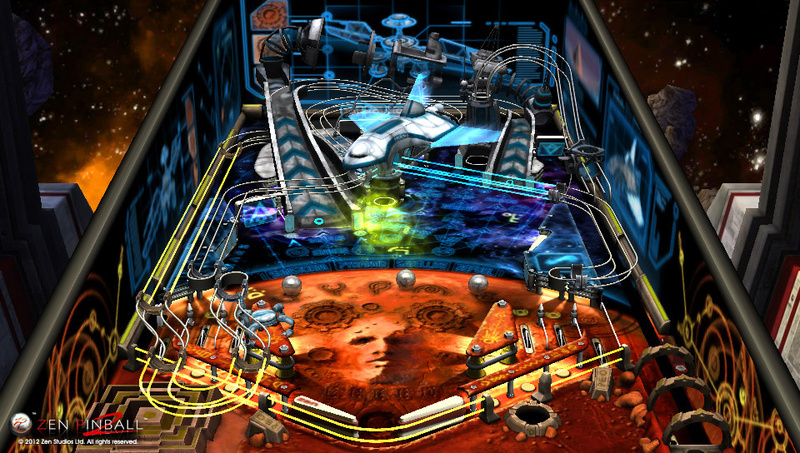 The intent is that, instead of paying for a core game, you buy downloadable tables at a couple of coins a pop after the initial 'purchase', which means Zen Pinball 2 can be as expansive and expensive as your tastes – or wallet – dictate. Each table can be trialled before you commit to buy, so rather than paying a basic fee for several stages you might not necessarily like you can use the money you'd usually spend on a set pack to grab a customised collection that you'll enjoy more. There are currently 26 tables for pinball wizards to play around with, a mixture of licenced and original boards. You can buy most individually, though Marvel stages have to be bought as a pack. 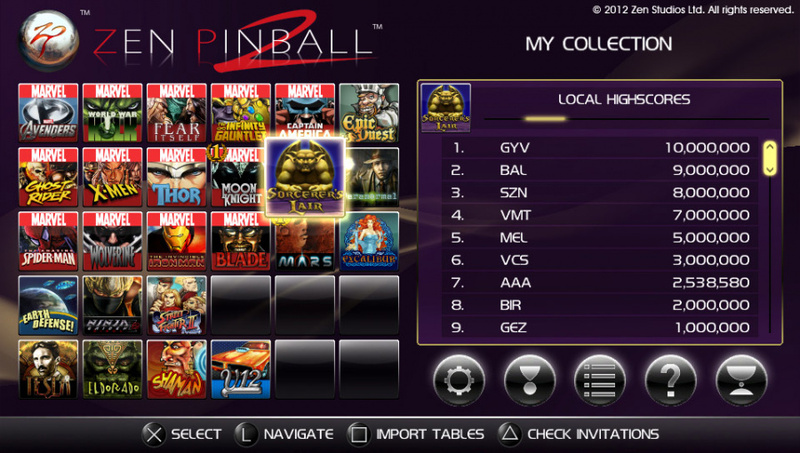 If you already own the first Zen Pinball or Marvel Pinball, you can import those tables into Zen Pinball 2 at no cost to play under one banner. You don't get to bring your scores across, unfortunately, but they do benefit from Zen Pinball 2's new engine, which apparently improves visuals and ball physics, and adds social functionality. There's great variety across the tables, and if you're a Marvel fan you're bound to have a particularly good time as there are loads of comic-inspired stages to pick up. Most of the tables have hidden depths that slowly unravel the more you flip those balls about and the better you get; after a few goes you'll notice extra flippers dotted around, previously unspotted lanes to shoot for and new bonus rounds activated by hitting certain spots or score boundaries. Sometimes you even get sent off to entirely new areas to compete in mini challenges. Zen has done well to keep each table interesting in its own right, and the licenced tables remain quite true to the source materials. Familiar bad guys romp about in the comic levels, while art work, animated models and well-known battle cries rattle out during the Street Fighter II collaboration. The new Plants vs. Zombies expansion features advancing undead 3D models to bowl over. Plus you get to see Tony Stark have a little boogie to himself in the Iron Man stage. As well as trying to score big on each table, competing with friends via online leaderboards, there's a persistent pro score that spans the entire package. Determined by how well you deal with each level and the number of tables you've tried out, it gives a general estimate of how awesome you are in comparison to your companions, and adds an extra level to the score-beating. There's a team score too, which combines your and your friends' performance and provides incentive to improve together as a collective. If you're one of life's boasters, you can also fill your Facebook timeline with scores directly from the game so even people that don't own the game can be proud of you. Messages pop up alerting you when you're about to surpass a friend's score and can be quite distracting, though it's simple to switch these off. You can also toggle the size of the scoreboard, special effects such as slow motion, control options and ball trails easily, plus enter operator menus to change flipper sensitivity if you're not happy with the default settings. The biggest bonus is that Zen Pinball 2 takes advantage of Sony's cross buy functionality, which means that if you buy any tables on PlayStation 3 you can also download them on your Vita and vice versa without any extra cost. Scores carry across both systems, so you never have to be far away from your favourite tables. On Vita you can also hold the console vertically and use the flippers with front or rear touch to take advantage of the screen's length. Whichever console you choose, it looks fantastic. The two versions are also cross-compatible for multiplayer, so handheld users can face off against home console players. On PlayStation 3 you can either play in split-screen, in hot seat fashion – swapping a single controller between multiple people – or via PlayStation Network. The options are the same on Vita, minus split-screen, and games can be customised with different goals – time limits, point targets – and penalties for loss of balls. If you're expecting a friend online you can reserve private slots for them in a game, which is a nice touch. Zen Pinball 2 is all you really need if you're after a decent variety of pinball tables to play around with; whether you're at home or on the move, your scores – and those of your friends, provided you have an Internet connection – are always there to be beaten. The tables are intelligently designed and not too costly, there are more than enough settings to fiddle with, and the chance to craft your own collection without being forced to pay for any unwanted tables is very welcome. "You don't get to bring your scores across, unfortunately,"
That was the only thing I didn't like about the new set-up. I did like bringing in my old Zen Pinball and Marvel pinball tables into 1 main menu, and trying out all of the different tables from within that menu is also a good way to go. So while I miss my old scores, I don't miss them enough that I'll be going back. I did spend about 30 minutes trying to figure out how to bring them in though so that was the really annoying part. The plants vs zombies table is just fantastic. My only complaint about Zen Pinball 2 is the small amount of trophies. From what I understand the old versions of the very same tables had more trophies, so I can't for the life of me figure out why they didn't just use the same trophies. I absolutely love the Infinity Gauntlet table! Sitting high at 38,415,186 score! Certainly getting this. I can't wait to try out Infinity Gauntlet. Love the competitive interface that's built into the new version though. I've put so many hours into Zen Pinball 2, or better yet, all the tables I've already put entirely too many hours into, all over again.